If you think sicence, technology, engineering, and math education are only for the classroom, think again! Parents and educators will be inspired by unique examples of STEM education in action in some very unexpected places...including an elementary school physical education class; and along the banks of our region's creeks and rivers where Girl Scouts take part in a unique program called STREAM Girls. STREAM Girls gives scouts the oppurtunity to earn badges as they serve as citizen scientists, anglers, and artists, in order to build an appreciation for watershed conservation and the enviornment. Learn more about our guests by downloading the discussion guide. 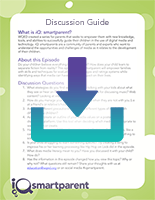 Download the accompanying discussion guide for more information about the episode, discussion questions, biographies of the guests featured in the episode, online articles, resources, and much more! Audubon Naturalist Society – Creek Critters app – Identify small organisms living in local streams to assess the health of the water. Downstream -Documentary about threats to watershed quality, produced by Point Park University, in association with WQED. For even MORE resources download the discussion guide!